There’s an awesome saying in Sweden: “There’s no bad weather… just bad clothing.” I LOVE this sentiment. The notion of getting fresh air, rain or shine, is very European. As most of you guys know, I grew up in Michigan and even in the deep of winter, my German mama would open the bedroom windows to air out our rooms every morning (raising eyebrows in the neighborhood, haha). Sweden has a similar philosophy. Children are encouraged to play outside all year round, whether it’s rainy, windy or even snowing. Even babies in their prams are strolled outside and allowed to nap in the fresh air. They simply make sure all babies and kiddos are wearing the right clothing. And that’s where our dear friends at Polarn O. Pyret (aka PO.P!) come in. In fact, they’re so passionate about this, they’ve declared this “EVERY DAY IS PLAY DAY” week! The challenge? 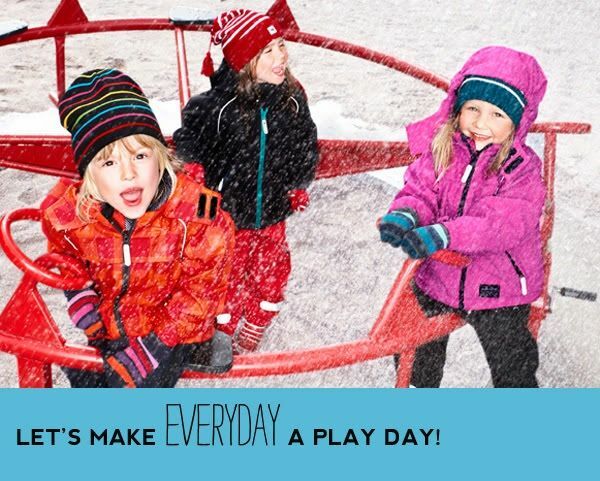 Get outside and play every day for one week, regardless of the weather! So how do you make this happen? It all comes down to LAYERS, my friends. You do this with great quality clothing that protects little ones from rain, wind and snow and keeps them nice and toasty warm. Pre-bent knees?? Genius. While we don’t get any snow out here in California, we often go home for the holidays to Michigan where there is SNOW aplenty. 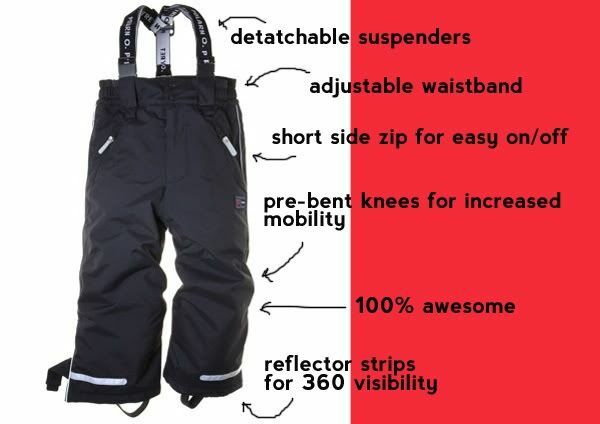 So I can’t wait to give their snow pants a test run! In addition to being well made, the clothes are built to last. You make an initial investment in a jacket and it’s not only going to last you for a season or two, but it’s made to be passed down to siblings (or lucky friends and cousins). 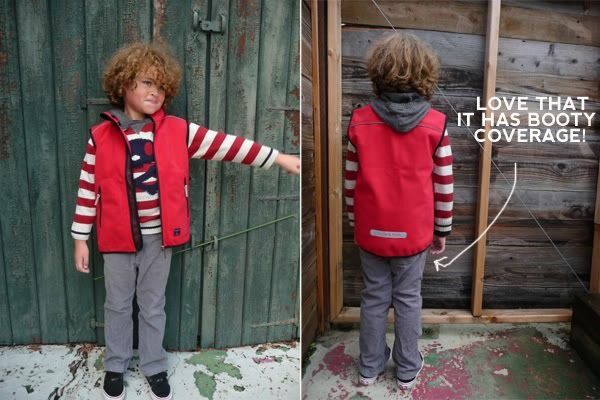 Did I mention that all of PO.P’s outerwear is tested by Swedish preschool children? Pretty cool. Despite what you may think, it can get pretty cold out here. Of course, it’s still milder weather than the rest of the country, so I was also eager to see what kind of layering pieces they had. 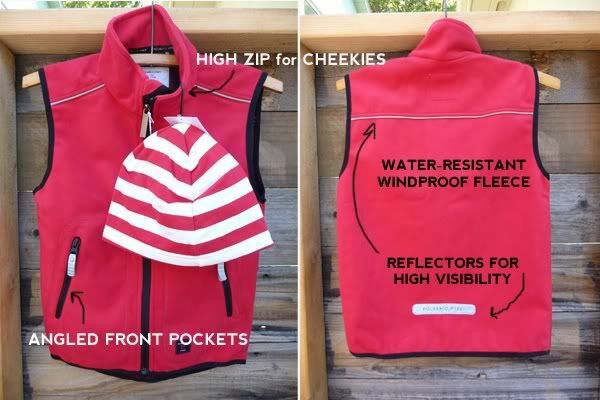 This cozy Windfleece Vest is awesome for cooler autumn days or layering with another jacket. I was impressed that it was water-resistant, because we do get a lot of rain. The high zipper has extra covering at the top to protect little cheeks and chins. It gets dark early in the winter months, so all their gear includes multiple reflectors for easy 360 degree visibility. 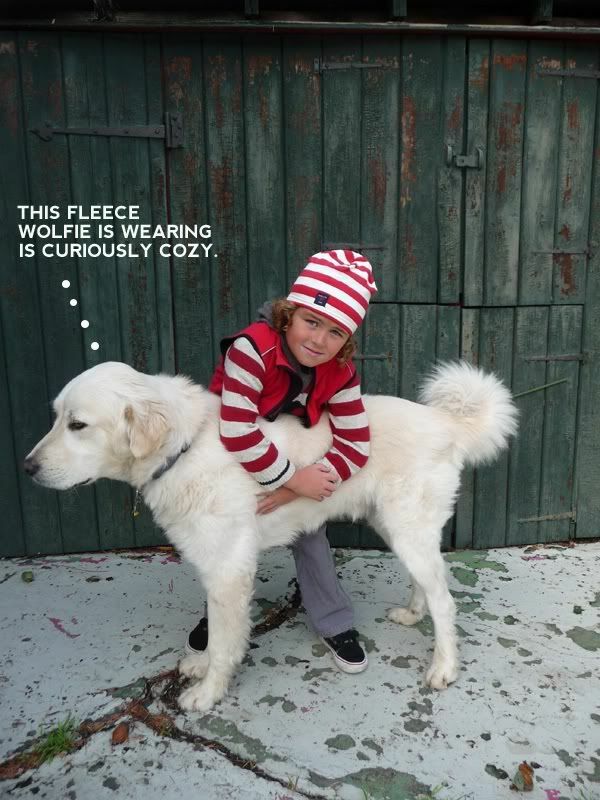 I find that the clothing is cut generously—Wolfie is wearing it in a size 6-7, and he has a bit of room to grow. He’s also wearing the super soft Block Stripe Sweatshirt Hat, which is perfect for our milder autumn weather. While temperatures can definitely dip here in Northern California, we’re lucky that children play on the playground year round….so Wolfie gets lots of outdoor play time every day. Also, the addition of Mr. Sam doggy has meant that we are taking lots more family walks in the beautiful redwoods in our area! Breathing in the crisp woodland air is one of my faaaaavorite things. Are your kiddos still getting outside and playing this season? Has it been rainy? Cold? Snowy?? Head on over to the Polarn O. Pyret Facebook page and tell us what you did this week! You could win some cool prizes, like a PO.P goodie bag. To see more of their outerwear, check out the site over here. Dottie will be back in a bit to share some of her thoughts on playing outdoors as well as the Peach in her snazzy striped jacket! 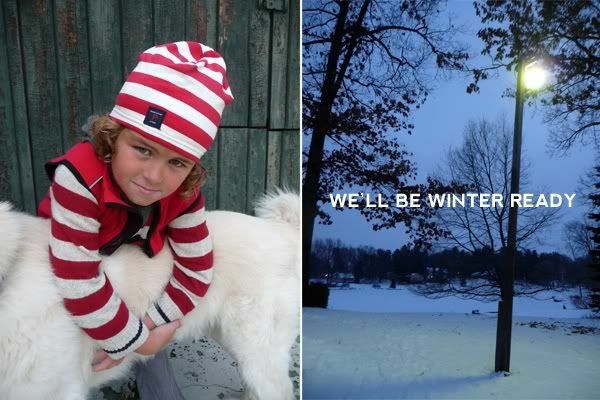 Tagged with Dressing kids for cold weather, Outerwear, Polarn O Pyret, PoP. We live in GR, Michigan and it just got really cold here yesterday. The sun was out however so it didn’t stop my son and I from going to the park to play! Unfortunately I forgot my hat and gloves…so even though I dressed my son Cohen perfectly for the weather…I was FREEZING! TOTALLY! we bundle the kids up and then forget about ourselves!! such a fantastic post!!!!!!!!!! wolfie looks GOOD IN RED! ze stripes! i love. and that photo of him hangin’ out over mister sam bone? I DIE. I just die from cuteness. thank you thank you….that Sam has become a big ol part of the family in just 2 short months! some day you’re gonna meet him toooooo. a whoooooole lotta cute going on here! I loooove the animations! SAM IS SO BIG!! The boots. Got to have the boots!